It's that time again, if you haven't done it already. Time to wake up the babies! I mean, germinate the seedlings. If they need cold stratification, then you may have to wait until next year or explain to everyone opening your fridge that: yes, the container of moist soil IS supposed to be there. The good news is that usually the seed you buy at the local garden store doesn't need that treatment. They only need some warm, moist soil to wake up. To grow strong, they need a sunny window and mild fertilizer. Liquid is best, if you are using organic, to avoid flies. 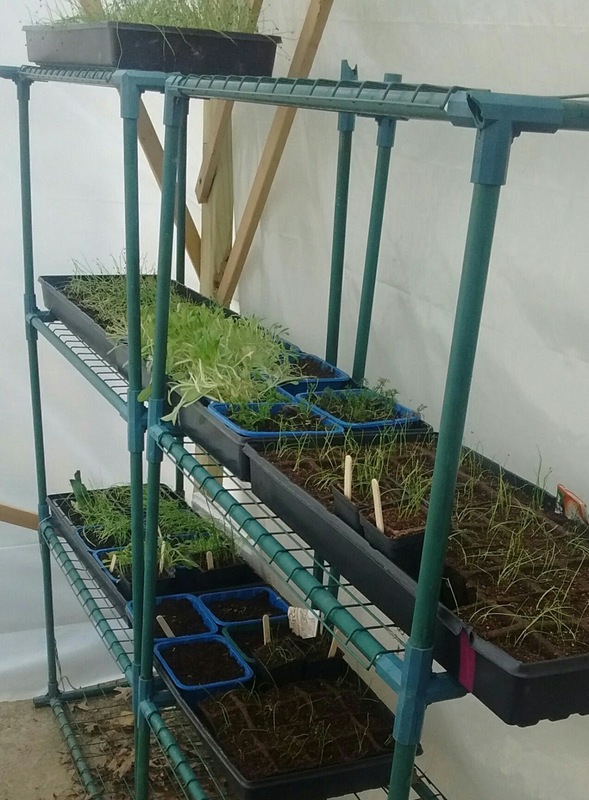 Here, some of my cold tolerant seedlings are up and getting used to the great out doors. What you see is: onions, elephant garlic from seed, Roman chamomile, cold tolerant lettuce, garlic chives, regular chives, alpine strawberries, and one leek from a cutting.